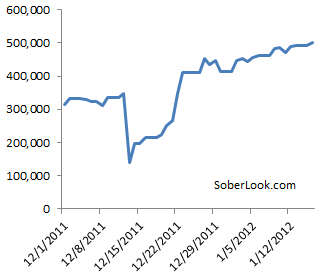 There have been a great deal of focus recently on the ECB Deposit Facility as it reached another record today. London Evening Standard: The huge amount - busting the previous record set last week - comes despite the ECB flooding the banking system with €489 billion in cheap loans to more than 500 banks last month. Analysts warned that banks were stuffing the cash into the ECB because they are too afraid to lend it to other potentially struggling banks while some are hoarding the cash to pay off their own debts maturing this year. Does it indicate "cash hoarding" by the Eurozone banking system because banks are afraid of lending or is there something else going on? First of all the euro area is a “closed system”. That means every new euro created by the ECB stays within the system. When the ECB lends to a bank it “creates” new euros temporarily until the loan is repaid. The ECB credits these borrowed euros to the bank’s reserve account. The bank has a choice to either keep the funds at the reserve account or move them out to the Deposit Facility which tends to pay a better rate than excess reserves. Banks generally keep the minimum amount necessary in the reserve account. They just want to make sure that the daily balances average out to a number that is above the minimum reserve requirement over a specific time period. 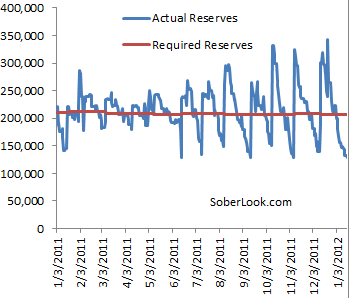 This makes the reserve amount “cyclical”. But what happens if a bank chooses not to deposit the borrowed money in the Deposit Facility? For example it decides to purchase an asset. If it purchases an asset from another bank, now that other bank has the extra money in its reserve account and has to make the same decision - whether to keep the funds in the reserve account or move them to the Deposit Facility. As Credit Suisse pointed out, it works a bit like musical chairs – with the last bank holding the cash in its reserves ultimately having to move it into the Deposit Facility. Here is where it gets interesting. If a bank lends what it borrowed from the ECB to a corporation (or an individual or a government), that borrower deposits the money with her own bank (also in the eurozone), where it ends up in the reserve account. If the borrower buys a truck with her loan, the truck seller still has to deposit the money at a bank (unless the buyer uses physical cash, which is a tiny amount of the overall euros in the system). No matter where it travels, that newly “created” euro ends up in some Eurozone bank’s reserve account. And unless that bank at the end of the musical chairs game needs that euro for its reserve requirement, it moves it into the Deposit Facility. Which means that even if the eurozone banks were lending massive amounts to each other, to governments, corporations, individuals, etc., the same amount of money would still end up at the Deposit Facility (assuming reserve requirements didn't increase). So the balances in the Deposit Facility depend on two factors: how many new euros the ECB put into the banking system and what are the banks’ reserve requirements at the time. That means that the Deposit Facility balances have less to do with how much lending eurozone banks are doing and more to do with the net borrowings from the ECB. The more banks borrow from the central bank, the larger are the initial total reserve balances in the system and the more gets moved into the Deposit Facility. The chart below shows the combination of bank reserves and the deposit facility with the cyclical movements between the two accounts clearly visible (as reserves decrease, the Deposit Facility balances increase and vice versa). Reserve balances and the Deposit Facility balances (EUR-mm, source: ECB.) 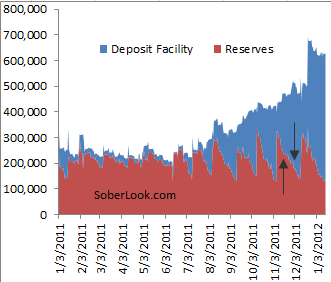 Note: in this chart the Deposit Facility amount is sitting "on top" of the reserves amount - these are not two separate charts. Therefore when the Deposit Facility balances increase, the banks are not really “hoarding cash” – they simply have no choice but to use the ECB's facility. The way to interpret this record deposit amount is that the banking system as a whole is borrowing record amounts from the ECB on a net basis.